If you are particularly a fan of vintage wedding themes, what else can be more appropriate for you than the Great Gatsby wedding theme? Believe me, you can bring the Gatsby glamour into real life from the big screen, on your own big day and make it real big with the glitter, feathers, pearls, art deco sequins and geometric patterns! Here are some top ideas for headpieces that will be the main attraction of your vintage wedding, courtesy of StoneyCreekBoutiques! This Rose Quartz Great Gatsby headpiece will make you real queen of the day. If you want multiple colors in the ribbon, you can get it to add more colors to your bridal persona. Glitter is an essential element of a Gatsby themed wedding and in that case, a crystal pearl headband is just the right accessory for you. It looks gorgeous with an intricate trim. 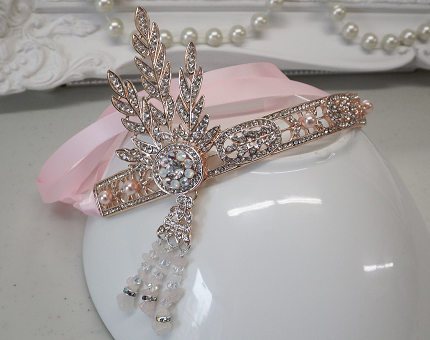 The crystals and pearls are attached to a metal headband to facilitate a perfect fit and durability. You can wear it yourself or give it to your bridesmaids or flower girl. This stunning headpiece will make you stand out from the crowd with the intense rich colors of peacock feathers and green rhinestones. For an elegant finish and snug fit, there is a double face satin black ribbon tying around your head’s back. All these headpieces are handmade by StoneyCreekBoutiques. 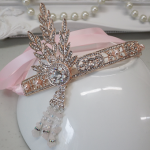 Visit their site to see a great range of vintage wedding jewelry to make your big day the real Great Gatsby day!